Behavior Product Reference | Dog Behavior Tools | Cat Behavior Tools | More! Hey! It's instinct! Cats love to rub their paws over rough surfaces. It feels good and the daily nail grooming helps with the following: 1. Keeps claws healthy (and well-manicured!) 2. Helps stretch and tone muscles 3. It's a natural behavior - cat's scratch! Finally! A scratching solution for you and your cat! Kitty Hoots Scratchy Mat Doorknob Hanger is a great diversionary device to help protect your furniture and home from cat scratching mass destruction. Catnip inside and feather teaser encourages your kitty to scratch. It's natural and recyclable! Teach your cat Positive Scratching to help prevent household destruction. Product is an angled scratching surface. The scratching insert can be renewed over and over again for economical use.Manufactured from heavy corrugated cardboard, this scratcher lures your cat into satisfying her itch to scratch. The layers of cardboard have a rough surface that mimics the feel of bark. A shiny mylar toy hangs from the bottom to entice the frisk out of your feline. What more, the scratcher includes a bag of dried catnip to entice your cat for that first scratch. 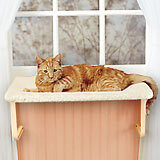 Cat Playpen features plenty of play space for litters of kittens or ferrets with two door openings for easy access. Product has easy-to-clean and sanitize plastic components, and easy-to-roll base with 1-1/2" swivel casters Use enzymatic odor neutralizers to clean kennels and any pet soiling "accidents" in the home.